Alwyn Crawshaw is known for his TV series on painting and is the founder of The Society of Amateur Artists in the UK. He and his wife June have produced a number of highly popular books and instructional DVDs to help people to get started in watercolors, sketching, oil painting and general painting techniques. The couple live in the beautiful Norfolk countryside in England; the perfect backdrop for their watercolour adventures. Their mission is to take away the mystery of creating art and to show that anybody can do it. Together with academic art instructor Sharon Finmark, Crawshaw produced this beginner's guide to watercolor painting. There is also a lovely section on painting animals by Trevor Waugh. The book is a gentle approach for beginners and is helpful for those who need the inspiration and encouragement to get started. Each artist shows you a step-by-step approach, introducing each element to build your painting up as your confidence increases. 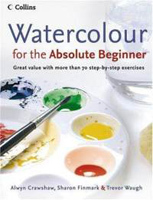 Because Water Colour for the Absolute Beginner focuses on watercolor painting, it allows you to gain competence with a relatively easy medium and will not bog you down with excessive information. It is not a comprehensive or serious course, but more the kind of thing you might take on holiday to enjoy at a relaxed pace. Whereas the overall quality is excellent, there is no student support or a large range of topics covered. There are other products in this category for the serious amateur or those who want a basis for academic study. But if you are looking for an enjoyable taster into the world of painting, then this would certainly be a great choice, providing hours of pleasure. The paintings in the book are beautiful and are an ideal inspiration for the learning artist. The student can see how a picture is built up through the easy steps, and create a rewarding result. The writing style is friendly and accessible, and ideal for those taking their timid first steps into painting. Most of the examples are for painting outdoor scenes, but there are steps to show you how to build up basic shapes that will help with other genres too. By comparison to the other more sophisticated types of products in this category, namely DVDs, CD-ROMs, online forums etc, the course material is low-tech and simple. There are no gimmicks, trademark tools or special features, but this book would make an ideal gift or a treat for yourself, and be a fun way for anyone to start a new hobby. At $11.58 from Amazon.com it is great value for money and simply too good to miss.